Lovely Mini Pair of Berry Red Beeswax Candles Measuring 4" x 0.75 Diameter with a burn time of approximately 5 hours depending on any room draughts. These candles will fit perfectly into a standard Candle Stick. 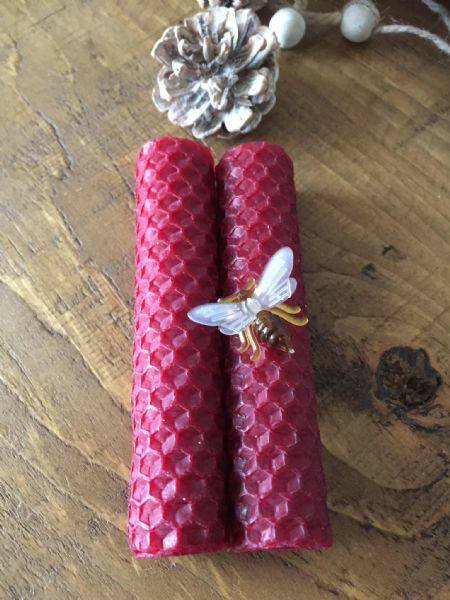 As with all our Beeswax Candles they have cotton wicks which are very healthy, they are smokeless & soot free. Always keep the wick trimmed to 5mm to allow for an even burn and remember to remove the Bee Pin before lighting the candle. Never leave a burning candle unattended and keep away from Children and Pets, loose clothing and curtains.